Buying or selling a house is a very large purchase or sale best not left to amateurs. You wouldn't put thousands of dollars into the hands of an amateur stockbroker, so why do it with your home purchase or sale? Here's what to look for in a listing agent and a buyers agent. Good negotiator. How does the agent negotiate? How many homes have they actually sold in the last year versus listed? What is the sold price versus the asking price? Are they a good negotiator and can they get the full price for the sale of your home? Referrals. See if you can get a list of referrals from the agent to find out how they handled other real estate transactions. But, just because they come with great referrals doesn't mean that they are the agent for you. Extensive online presence. This doesn't mean that the agent has to be perfectly versed in online marketing, but they should be able to advertise your home on a variety of websites and social media accounts. Nearly 98% of homebuyers will go through real estate sites such as Zillow and Trulia before setting foot in the house, so make sure your presence is known across all of the real estate websites. A buyers agent facilitates the transaction on the buyer's side versus representing the homeowner. Here are some things to ask a buyers agent. How well do they know the neighborhood? Just because there are great buyers agent doesn't mean they know exactly how much homes are in particular neighborhoods. You certainly don't want to overpay for anything. Make sure your agent knows the neighborhood in which you're buying so that you don't overpay and can negotiate for your terms. Will the agent help with future exit strategies? You usually don't think about selling when buying, but it isn't a bad idea. You will probably sell the home down the line so it's important to buy a home with good resell value. Do you like the agent? Are they too aggressive for you? Are they two hands off? Are they two hands on? Do you need handholding or do you prefer to contact them on your terms? You have to find it agent that goes with your communication style so that you feel comfortable and confident about your purchase. Ready to ask me any of these questions? Feel free! 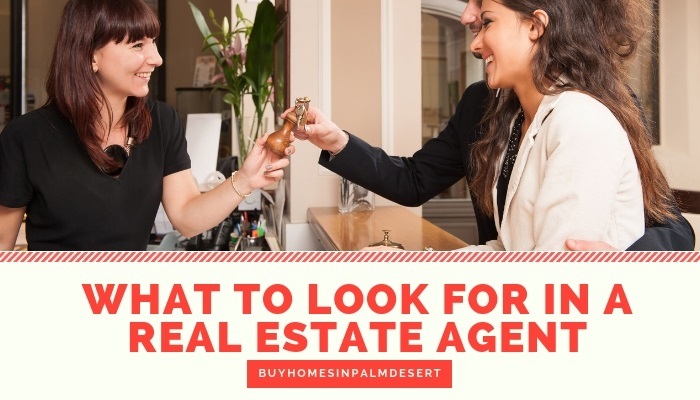 Either leave me a comment here or simply contact my office at any time for listing or buying homes in Palm Desert.